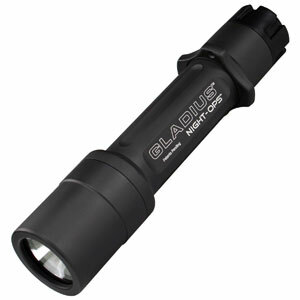 The Gladius is a LED flashlight intended for law enforcement or spec ops members that can certainly be a lot of fun for a flashlight enthusiast. The light comes in HA-3 finish, uses 2 C123 batteries and can output up to 80 lumen (aprox). The light operates in 4 channels (modes) that can be selected with a polymer ring at the end of the light. The first mode is constant-on mode, you press the tailcap button to turn the light on or off. You can also keep the button pressed to change the brightness level, the brightness will go from the brightest mode to the dimmest and then back. In channel (mode) 2 you have the strobe that I'm going to discuss in some detail soon. Mode 3 is momentary on/off using maximum brightness. Mode 4 is lock-out mode to avoid accidentaly turning the light on or off. You can turn the light on in channel 1 regulate the brighness and then move the ring to channel 2 (strobe) or 3 (momentary max) then just pressing the button you activate the selected mode. This is useful when you want to use a dim light to check something but have a strobe or max power beam ready in case of emergency/need. It is possible to program if the light goes low to high or high to low in mode 1 and it is also possible to program the light to "remember" the brightness level in mode 1 so it is resumed when you switch the light on. The light has a lot of throw for a LED light, and it is very bright. The strobe is designed to confuse an eventual hostile individual or attacker, my experiments show that the strobe not only disorients and suprises the individual but he can also lose sense of depth and perception of distance so you can use the strobe in emergencies to run away from danger. The surprise effect is important, if your attacker sees the strobe at long distance he can "think" about it and attack you effectively. A very complete light, very bright and fun to use. You can get it from $120 to $200 in different retailers so I will let you do the research. Lock-picking is both a useful skill when you are in need and a fun hobby too. The FPS7 Tool by Southern Specialties is a EDCable set of picks and a tension tool packed in a ver small and light aluminium frame. The tool has 8 different picks for different types of locks and a removable tension tool. I have tested the tool and it is a pleasure to work with, most locks are easily opened and you can't tell the difference with the bigger tools. The lever that is used to "lock" the pick you select in place is particularly good giving very good tactile feedback while keeping the pick firm. You can check this and other fun lock picking tools at Southern Specialties Website. And if you want to be curious about lock picking you can check the MIT guide to lock picking or visit the site of lock picking hobbysts in the US (http://toool.us/).